Should We Rescue Biglaw, Part II? People were always asking San Francisco attorney Mae O’Malley how she lined up so much contract legal work as she juggled continuing her law career and raising three children. Her secret: As a former in-house counsel, she had built up a clientele, including Google Inc., and was ready for solo work after her third child was born. Last year, O’Malley, 34, created a company built on her strategy, giving her the opportunity to share the trick with the many other women who have asked about it. She opened Paragon Legal Group in September, and already has 20 lawyers working for her on either a full-time or part-time basis, 90% of whom are women. The attorneys make as much as $175 per hour and she expects the San Francisco-based company will have $1 million in revenue this year. So…should women stay at firms that don’t accomodate their families – or leave? I think the answer is pretty clear. Register for 7-Figure eBook LIVE (or remote) and in 7 hours, we’ll help you create a piece of content that will bring revenues in the door right away and will produce enough content for your 2019 marketing initiatives. 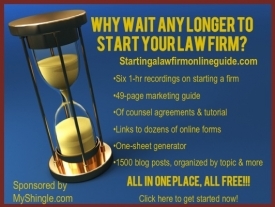 Solo & Small Firm Lawyers Average $198k/year…So Why Do We Portray Solos As Losers? Is $160,000 For A Solo Out of Law School Realistic or Rare? Long before entering a courtroom, you can improve your chances of winning by positively predisposing a judge to you and your case. Learn how here.